"This honor reflects our team's unwavering dedication to our clients, without whom we would not be able to achieve this tremendous level of success." Esteemed national business publication, Forbes, recently placed Moneta Group Partner Diane Compardo as the highest-ranking woman financial adviser in the state of Missouri on its "Best-In-State Wealth Advisors" list. The ranking appeared in the magazine's February 2018 issue, as well as online. Compardo was chosen from more than 21,000 nominations and is one of only four women in the entire state of Missouri to be named to the list. Forbes selected more than 2,000 of the top U.S. wealth advisers to rank by state for their 2018 annual listing, which was compiled by SHOOK Research. Only 30 advisers from the entire state of Missouri were named to the prestigious list. Honorees were nominated by their firms and subsequently researched, interviewed and assigned a ranking within their respective states. "I am humbled and flattered to be included among the industry-leading advisers on this well-respected list," Compardo said. "This honor recognizes the accomplishments of the entire Compardo Team. In particular, it reflects the team's unwavering dedication to our clients, without whom we would not be able to achieve this tremendous level of success." To be chosen, Compardo was interviewed by SHOOK Research and evaluated using an algorithm of qualitative and quantitative data. Factors taken into consideration included industry experience, community involvement, client retention data and revenue trends. "It is our belief clients are often better served by local representation," R.J. Shook, president of SHOOK Research said. "Many of the clients we talk to say they consider their advisors and teams like a part of their families, so it's nice to have them close by." The Forbes' honor is among several national accolades Compardo has earned in recent years spotlighting her professional achievements. 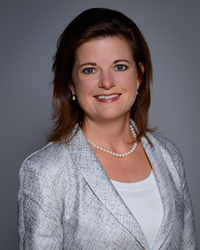 She has been named to Barron's list of Top Women Financial Advisors in the U.S. twice, as one of the "Top 100 Women Financial Advisors in the U.S." by Financial Times, and a "Top Wealth Advisor Mom" by Working Mother magazine. Compardo was also named one of "America's Top Women Wealth Advisors" by Forbes in 2017. Within the St. Louis community, Compardo has been honored as a "Women Influencing Business" by The St. Louis Business Journal and included on St. Louis Small Business Monthly's list of "Best Wealth Managers" and "100 St. Louisans You Should Know to Succeed in Business." She has been honored with the Missouri Athletic Club's "Women of Distinction" award, as well as a "Reaching Out" award from Town & Style magazine for her commitment to philanthropy in the St. Louis community. The Metro St. Louis YWCA recently named Compardo a 2017 "Leader of Distinction." As a fiduciary and advocate, Compardo leads a team of 17 professionals who are dedicated to helping high-net-worth and ultra-affluent clients simplify the many financial issues they face in today's complex environment. The Compardo Team currently advises on $1 billion of assets. Headquartered in Clayton, Mo., Moneta Group provides wealth management services to successful families, businesses and institutions. Founded in 1869, the firm has $20 billion in assets under advisement (AUA) and is one of the largest independent registered investment advisory (RIA) firms in the U.S. For more information on Moneta Group, visit http://www.monetagroup.com. Find out more information about The Compardo Team.